Narrated By: Roger Rees, Arte Johnson, Michael York, Simon Vance, Alfre Woodard, Stefan Rudnicki, Stephen Fry, Roscoe Lee Browne, Elliott Gould, Christopher Cazenove, Michael Tucker, David Warner, Jean Smart, Cassandra Campbell, Gabrielle De Cuir, Bronson Pinchot, Various Narrators, Joel Grey, Melissa Manchester, Gregory Hines, Phd Elliot Engel, Kevin Mccarthy, Efrem Zimbalist Jr. They are icons of the literary world whose soaring works have been discussed and analyzed in countless classrooms, homes, and pubs. Yet for most readers, the living, breathing human beings behind the classics have remained unknown—until now. 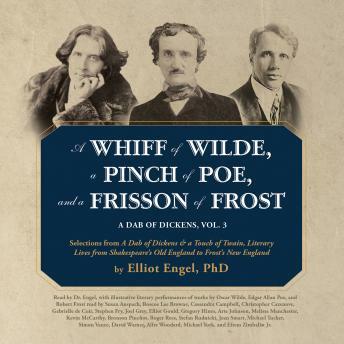 In this utterly captivating book, Dr. Elliot Engel, a leading authority on the lives of great authors, illuminates the fascinating and flawed members of literature’s elite. In lieu of stuffy biographical sketches, Engel provides fascinating anecdotes. You’ll never look at these literary giants the same way again.